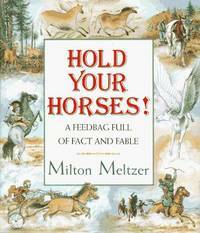 Home > Meltzer, Milton > Hold Your Horses! Harpercollins Childrens Books. Hardcover. 0060244771 New Condition. . New. Harpercollins Childrens Books. Hardcover. 0060244771 New Condition *** Right Off the Shelf | Ships within 2 Business Days ~~~ Customer Service Is Our Top Priority! - Thank you for LOOKING :-) . New. Harpercollins Childrens Books, 1995-10-01. Hardcover. Used:Good. Harpercollins Childrens Books. Hardcover. 0060244771 Like New Condition. . Fine. New York: Harper Collins Publishers. Very Good condition/Very Good Bright dustjacket,ex-lib. 1995. 1st Edition. ISBN 0-06-024477-1 . HarperCollins, 1995-10-30. Library Binding. Good. Harpercollins Childrens Books, 1995-10. Hardcover. Good. Harpercollins Childrens Books. Used - Very Good. Ships from the UK. Former Library book. Great condition for a used book! Minimal wear. 100% Money Back Guarantee. Your purchase also supports literacy charities. Harpercollins Childrens Books, October 1995. Hardcover . Used Very Good/Very Good. Dust Jacket is clean and intact, with minor edge and corner wear. Front and back covers are almost undamaged, with very slight edge and corner wear. Spine intact and undamaged with no creasing or warping. Binding is tight and intact, pages clean and unmarked. In very nice, but previously owned condition with minimal damage. We carry new and used books in our storefront. We want you to be satisfied with your purchase. Please contact us if you have questions regarding this item. Harpercollins Childrens Books, October 1995. Hardcover . Used Good. We carry new and used books in our storefront. We want you to be satisfied with your purchase. Please contact us if you have questions regarding this item. HarperCollins Publishers, 1995. Library Binding. Good. Disclaimer:A copy that has been read, but remains in clean condition. All pages are intact, and the cover is intact. The spine may show signs of wear. Pages can include limited notes and highlighting, and the copy can include previous owner inscriptions. At ThriftBooks, our motto is: Read More, Spend Less.Dust jacket quality is not guaranteed. HarperCollins Publishers, 1995. Hardcover. Very Good. Disclaimer:A copy that has been read, but remains in excellent condition. Pages are intact and are not marred by notes or highlighting, but may contain a neat previous owner name. The spine remains undamaged. Harpercollins Childrens Books, 1995-10-01. Hardcover. Very Good. Ships Out Tomorrow!